More than 500 people attended opening day, which allowed only passholders on the trails. The resort opened to the general public on Saturday. The lifts opened just before 10 a.m., Friday, but Killington’s most devoted started arriving to the parking lot at 7 a.m. to get in line. Kovalesky was unable to ski Friday due to an injury, but he couldn’t miss opening day. An eager crowd gathers to get on the first chairlifts of the season. Kovalesky, who lives in Connecticut, took the morning off from work. He spent the afternoon working remotely for his business development position. Kovalesky is an avid skier who started the 100 Day Club at Killington about five years ago. Skiers and rider who hit the slopes 100 days in one season are inducted into the club. There were about 250 inductees last year. Many of them were skiing on Friday. Cold temperatures allowed Killington to open about three weeks earlier than last year’s opening day, Nov. 8. Overcast weather turned into blue skies on Friday. Killington offered a free luncheon for everybody there, with meatball sandwiches, soups, and grilled cheese sandwiches. Everyone also received a free neck gaiter with the words, “Day One” stamped on the front. Peggy Golonka, another 100 Day Club member, wasn’t expecting the early opening, but like, Kovalesky, she couldn’t miss opening day. “Everything got dropped so we could come up,” said Golonka, who wasn’t finished putting away summer belongings yet. Golonka and her husband live in Massachusetts in the summer and move to a condo in Killington for the winter. “It’s our passion,” she said. Maria Lanka of Long Island, New York, skied 14 runs on opening day and continued skiing through the weekend. “It was beyond what I thought I was going to be able to ski,” she said. Some couldn’t wait for opening day. Michael Kever Hirschbuhl and his brother, who both study at Castleton University, hiked up to the mountain with their skis on Tuesday, Oct. 15, the day Killington crews started making snow. The snow just covered the grass at the time. Rime, Reason and the Upper East Hill trails were open to skiers and riders for opening weekend. Snowmaking continued on Sunday and the snow guns continued blowing on Monday. 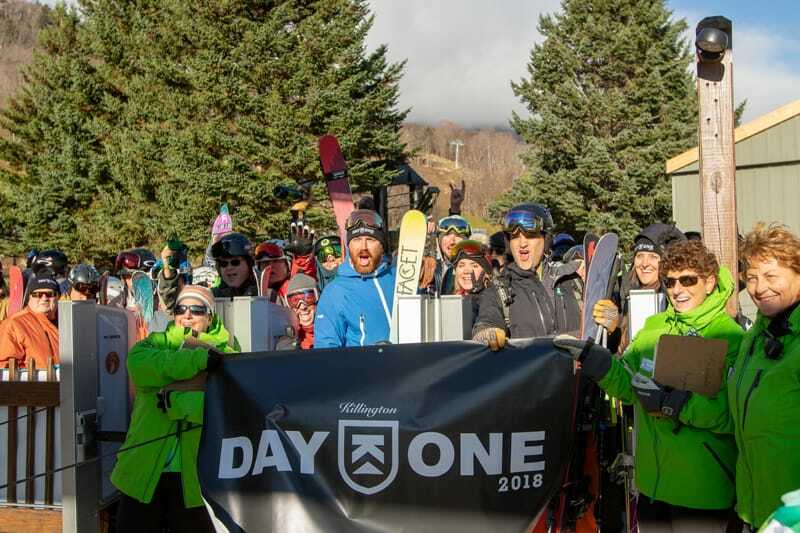 “For most of it it was full coverage and felt like a normal day on the snow,” said Killington spokesperson Courtney DiFiore of Day One.